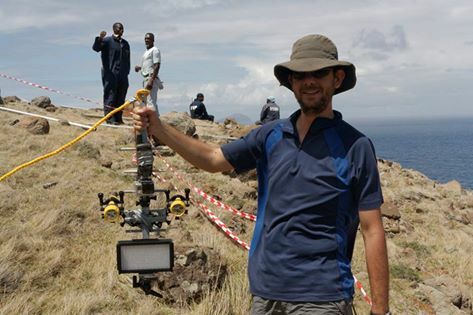 The sinkhole uncovered two weeks ago on the North West Bluff is not connected to current or new volcanic activity, announced the Montserrat Volcano Observatory (MVO) on Friday. In its weekly report, the MVO said “staff conducted further investigations into the sinkhole in the North West Bluff area. During a visit on 2 March, a sensor array with a video camera, a temperature and humidity logger, and a GPS was lowered to a depth of 39 metres (129 feet) in the sinkhole where the air temperature was 25.8 degrees Centigrade and humidity 91%. “An SO2/H2S gas detector was lowered to the same depth and no SO2 or H2S was detected. Images from the camera show volcanic deposits that have undergone varying degrees of hydrothermal alteration. These are clearly features of an old, now extinct soufriere. The video camera also recorded the sound of waves breaking, probably inside a cave, which increased in volume with depth. 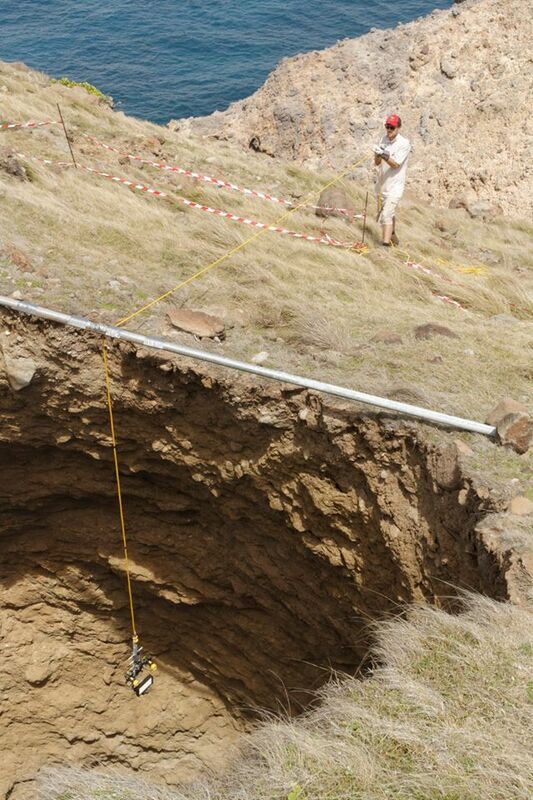 MVO Photo of the probe being lowered into the hole. “The data gathered by the sensor array confirms that the sinkhole is not related to nor caused by any new or ongoing volcanic activity. The origin of the sinkhole is the result of natural processes of erosion and collapse cause by the action of sea waves on the hydrothermally altered rocks in the area. What has previously been described as steam or “salty steam” is in fact just sea spray generated by waves breaking, probably inside a cave at depth, and being drawn up through the sinkhole by the action of the wind blowing across the surface. The measured depth of 39 metres is the depth to a prominent ledge located just above the entrance to a small passageway at the bottom of the sinkhole. This smaller passageway clearly connects to one or more other cavities further underground and eventually to the sea. “DMCA and the police are advising the public to avoid this area as it is considered dangerous and there is a risk of further collapse. The sinkhole is being fenced off. “MVO will release a full written report on the investigations into the sinkhole in due course.